An international team of scientists jointly led by Professor Ye Kai from the School of Electronics and Information Engineering of XJTU and Professor Ian Graham from the University of York in UK, in partnership with researcher Ning Zemin from the Wellcome Trust Sanger Institute, have published the DNA sequence assembly of the opium poppy genome, and uncovered the key evolutionary steps in the productionof the pharmaceutical compounds noscapine, codeine and morphine.This breakthrough, published in the latest issue of Science, revealed the origins of the pathway leading to theproduction of the cough suppressant noscapine as well as the painkiller drugs codeine and morphine. The opium poppy has been both a friend and foe of humanity throughout the history. Morphinan-based painkillers are among the most effective and cheapest treatment for the relief of severe pain and palliative care. 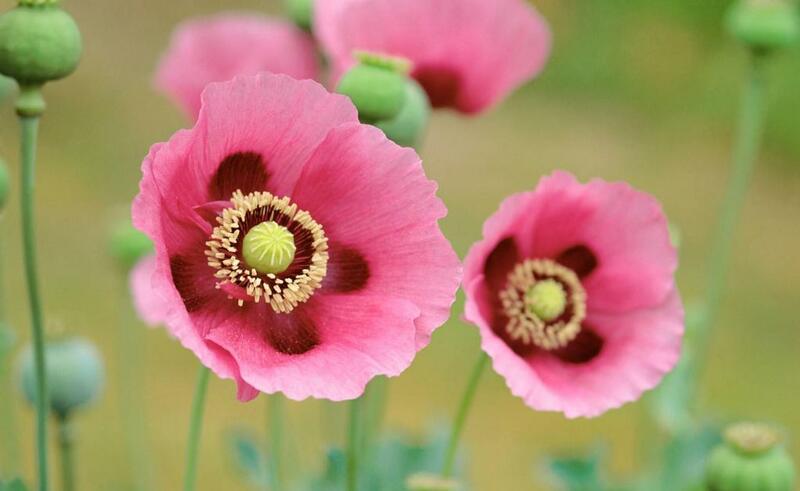 Opium poppy also produces cough suppressant and anti-cancer noscapine. However, due to the addictive properties of morphinans, careful medical prescription is essential for avoiding drug misuse. Currently, a huge discrepancy around the world in the dose of morphine equivalent available to alleviate serious health-related suffering has existed, with the USA and Canada having over 3000% of the estimated need, 870% in Western Europe, 16% in China, 8% in Russia, 4% for India and 0.2% for Nigeria. The lack of access to pain relief or palliative care, especially among the poor people in low to middleincome countries, has recently been recognized as a global health and equity imperative. The genome decoding of this important medicinal plant lays a foundation for exploiting its pharmaceutical potential through plant breeding and synthetic biology. Professor Ye Kai and his colleagues produced a high quality assembly of the 2.7 GigaBase opium poppy genome sequence distributed across 11 chromosomes. Plants often have a remarkable capacity to duplicate their genomes.When it happens, the duplicated genes are free in evolving for other things, allowing plants to develop a new machinery to make anamazingly diverse array of chemical compounds that are used to defend against the attacks from harmful microbes and herbivores, and to attract beneficial species, such as bees, to assist in pollination. Genome co-linearity analysis shows that opium poppy experienced a whole genome duplication (WGD) at around 7.8 million years ago, and additional ancient duplication events at least 110 million years ago. The genome assembly allowed the identification of a large cluster of 15 genes encoding enzymes involved in two distinct biosynthetic pathways for the production of both noscapine and the compounds leading to codeine and morphine. The genome assembly also allowed the identification of the ancestral genes coming together to produce the STORR gene fusion, which is responsible for the first major step on the pathway to morphine and codeine. This fusion event happened before the relatively recent completion of genome duplication event in the opium poppy genome in 7.8 million years ago, but that is still long before the Homo sapien ancestors firstly emerged on our planet about 200,000 years ago. Compounds like noscapine, codeine and morphine are chemically complex, with their chemical synthesis difficult and the price much more expensive than plant-based production. Synthetic biology-based approaches are now being developed, whereby genes from plants are engineered into microbial systems, such as yeast, for enabling production in industrial fermenters. However, opium poppy remains the cheapest and the sole commercial source of these pharmaceutical compounds by some distance. The publication of the genome sequence will provide a foundation for further improvement of this medicinal plant in pharmaceutical industry through molecular breeding approaches. Professor Ian Graham, another co-corresponding author of this paper from the Centre for Novel Agricultural Products, Department of Biology, the University of York, said, “Biochemists have been curious for decades about how plants have evolved to become one of the richest sources of chemical diversity on the earth. Using high quality genome assembly, our study has deciphered how this has happened in opium poppy. At the same time, this research will provide a foundation for the development of molecular plant breeding tools which can be used to ensure that there is a reliable and cheap supply of the most effective painkillers available for pain relief and palliative care for societies in not just developed but also developing world countries”.